2 Bedroom Detached House For Sale in Stoke-on-Trent for Offers in the region of £340,000. We are delighted to offer for sale one of Alsager's iconic cottages built circa 1850 and located within easy walking distance to the village. This charming home offers everything you would expect to find with a cottage; exposed beams, wood burner, latch & brace doors and low ceilings. The accommodation downstairs comprises of a reception area, lounge, dining room, kitchen and shower room. Upstairs there are two double bedrooms and the main bathroom. Externally, the property benefits from having good sized gardens to the front and back, a single detached garage and ample off road parking. Truly, one not to be missed! leaded window to front elevation, feature fireplace, single panel radiator. Exposed timber beams, latch and brace door and a multi-fuel burner inset to a tiled hearth make this a cosy cottage lounge. Two leaded double glazed windows to front and side elevation, the room benefits from built in storage cupboards and a single panel radiator. Double glazed leaded window to rear elevation overlooking the lawned garden. Exposed timber beams and built in storage cupboards. Ceramic tiled splash backs, one and a half bowl drainer with monobloc tap over inset to roll top work surface, space for cooker, single panel radiator, door to under-stairs storage. An archway opens through to a very useful reception area with a vaulted ceiling with recessed down-lighters, sliding French doors to the garden and door to the shower room. Double sized bedroom with a brace and latch door. Double glazed leaded window to the front elevation. Loft access and a single panel radiator. A double sized bedroom with a built in storage cupboard. Double glazed leaded window to the front elevation. Loft access and a single panel radiator. White suite comprising WC pedestal wash and basin 'P' shaped panelled bath with chrome bath shower mixer over ceramic tiled splashbacks wall mounted chrome heated towel rail, built in airing cupboard, housing the boiler and storage shelving, UPVC double glazed obscure leaded window to rear elevation, walls tiled to half height. 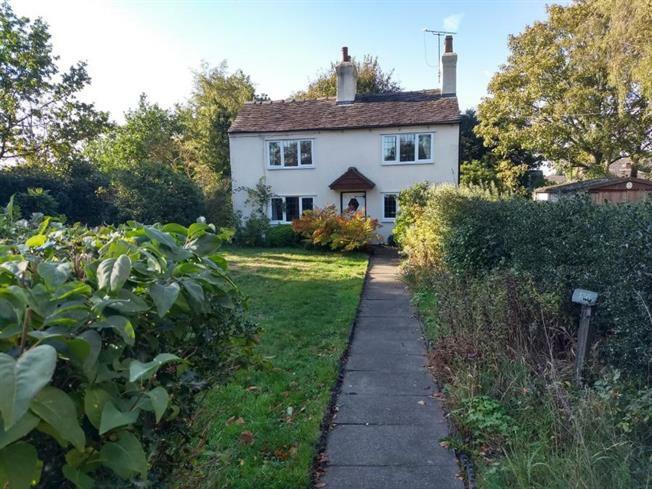 The property sits on a large sized plot, with a lawned area to the front and rear. The gardens offers established planting and hedgerows together with a paved patio area. Single detached garage and ample off road parking via a five bar timber gate.